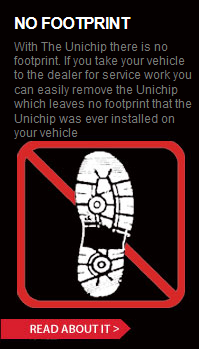 Can I tune my car with the Unichip myself? Short answer – Yes you can if you want to. Long answer – If you purchase a PnP kit, it will arrive already tuned and shouldn’t need any additional tuning. If you either want to tune, or you have an application that isn’t supported by our PnP options, you can certainly tune the Unichip with the Uni-Tune software. The Unichip can be tuned as many times as desired and can be tuned to work with any desired vehicle or any set of parts on those vehciles. With the Uni-Tune software, you can “tweak” the custom maps that come on a Unichip included in a Plug-n-Play kit or build maps from scratch. The Unichip is capable of controlling a lot of functionality, and with the Uni-Tune SW, you control every aspect of the Unichip. 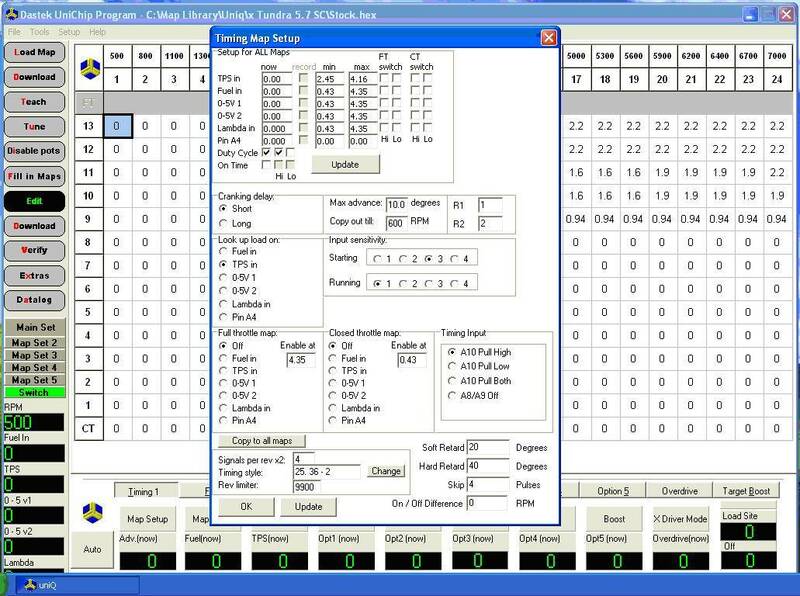 Technical answer – The Uni-Tune software allows the user to access via a Windows based PC so that you can adjust and modify any values the Unichip is using. Because the UniQ works on essentially any application, there are a series of settings that can be adjusted so that the UniQ can talk with the desired OEM computer. You can have Map 1 set up to talk with a 2010 Z06 and map 2 set up for a 2001 Toyota Tacoma (there are five map sets in the UniQ and all can be set up as desired) that each require different settings for communication. In the screen shot above, you can see that you can choose what the UniQ uses for it’s various inputs and then specify minimum and maximum values. On this screen you can also see the current values, set when the UniQ begins changing signals during engine start, set input sensitivity, set up full throttle and closed throttle maps, set a rpm limiter, and choose the crank style. Each of the various functions have their own set up pages with the appropriate variables listed. You can set the settings files accordingly and put the Unichip in the Corvette in the morning and then switch it to the Tacoma in the afternoon… obviously that’s not a likely scenario but it’s a way of pointing out the UniQ is pretty flexible. When it comes to actually tuning, you can close out of the setup screens and have a high density map to make your changes in. The UniQ has five map sets each of which contains multiple tables you can see on the option tabs at the top of the lower section of the tuning display in the fuel map above. 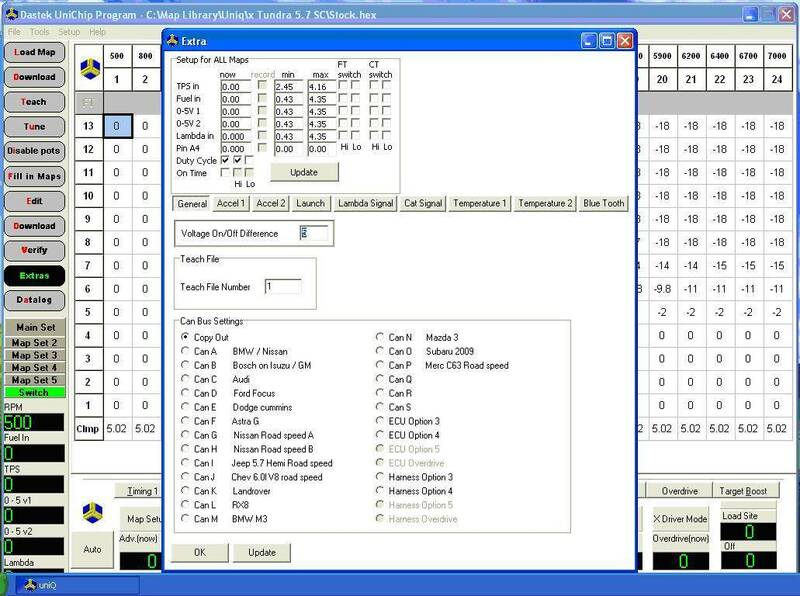 You can access timing, fuel, TPS, Boost, and six “optional” tables that you can set up to manipulate essentially any signal that you can tap into from the OEM sensors or tap into something that you add as an additional sensor. In each of the “option” tabs, you have multiple options to choose from that appear when you click the “Off” button under the Option button as shown in the screen capture below. If you click on the Extras tab on the left column, you get access to additional capabilities like launch control, Lambda signal manipulation, map temperature compensations, cat signal manipulations, and CAN bus access. The Uni-tune SW gives you complete access to the most advanced piggyback tuning system in existence. Whether you want to simply tweak an existing map for a higher octane fuel, or add a progressive nitrous system and tune a turbocharged stroker motor, the UniQ can handle the job and with the Uni-Tune SW so can you. For a more complete list of capabilities, take a look at the Tuner Section of our website.